Many of you may already be familiar with Daisy de Plume from my post about the Treasure Hunt at the Louvre I enjoyed over the summer. Daisy is the creator of these amazing scavenger hunts, a unique and exciting way to visit this classic museum. But she has also been up to a whole lot more recently, including the launch of THATd’Or (Treasure Hunt at the Musée d’Orsay)! So I asked Daisy to share with us an update on these exciting developments, as well as some background on her innovative creations. For more information on Daisy’s events, as well as the most current updates, I also invite you to visit her site: THATLOU.com. The following is Part I of my interview with Daisy. Part II will follow next week! Could you describe for us your company, THATLou, and the idea of the treasure hunts? THATLou, which stands for Treasure Hunt At The Louvre, aims to make one’s visit to the grandfathers of museums fun, focused and refreshing. As treasure hunts go, THATLou is quite simple: each team (consisting of 2 to 4 people) must photograph themselves in front of as many works of art on the list as possible, collecting varied points per photograph. 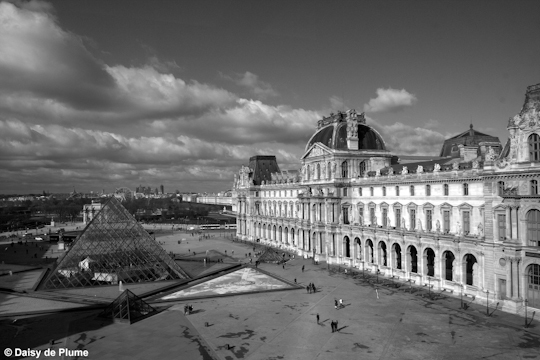 The clue-manual provides 15 to 25 pieces of “Treasure” pertaining to a theme, with its photo, title, artist, date and country (which is how you locate it on the Louvre map… But attention: No GPS!). Bonus questions are embedded within the text— sometimes requiring silly poses (a prancing putti or debauched Dionysus, perhaps? ), or sometimes they’re educational, referring to articles about the Louvre’s collection from the THATLou blog or from the information sheets within the museum. I’ve designed 12 different hunts for the general public, one per month of the year. The market is fairly broad, ranging from families and tourists who are visiting Paris and order already-existing hunts to locals having birthday parties and hen / stag parties (the Love + Marriage hunt is popular for the latter, as is Debauchery + Gluttony). The last category of treasure hunts is specially tailored hunts, which I design for the client – this ranges from corporate team-building events (for instance I did a Wheels + Motion treasure hunt for Piaggio, appropriate to the makers of the Vespa scooter) and at the moment I’m having a ball building an “Arts + Sciences” treasure hunt for a Paris-based NGO whose mission is to ignite underprivileged teenagers’ interest in science. What about the newly launched THATd’Or? 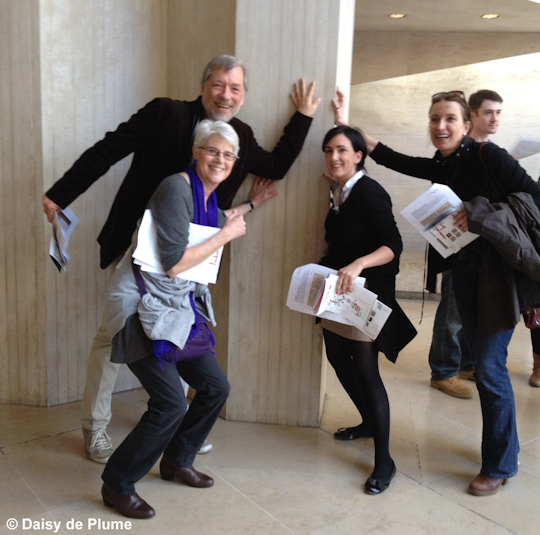 We opened 2013 with our first THATd’Or (Treasure Hunt at the Musée d’Orsay) which was run in conjunction with the AFMO (American Friends of the Musée d’Orsay, a fundraising body that has done miracles for the restoration and viewing of impressionist art). It was a terrific success, and led us to collaborate again on a private hunt just last week. Our first theme was “Movement + Motion”, in honor of the building’s history. This more recent hunt’s theme was the “Female Form”, since our audience was an exclusive woman’s club of expats in Paris. The Musée d’Orsay is another ball park altogether. The goal of THATd’Or is the same — to provide a fresh overview or perspective of the museum through a focused, fun thematic visit – but both the format and the hunt is different from THATLou. Ticking off basic differences: the Musée d’Orsay’s collection starts off where the Louvre leaves off, the d’Orsay is a 6th the size of the Louvre (which is 65,000 m², making it one of the largest geographic museums in the world), moreover the Musée d’Orsay doesn’t allow photography, other than in designated areas (which of course eliminates the very linchpin of THATLou). Another important distinction is that the Musée d’Orsay was formerly a train station, so it’s very easy to have a sweeping view of several bodies of work from a single juncture within in the museum. Though my taste for painting and sculpture pre-dates the Musée d’Orsay (my heaven is the 17th century), so far as museums go there is no other museum I respect quite so much. And for a reason that runs quite to my own detriment, keeping me on my toes! Most museums, the Louvre included, are guilty of leaving so much of their treasures accumulating dust in storage. Moving paintings and sculptures is expensive – just think of the insurance – plus it makes plenty of work for the curatorial staff. This is one of the many places where the Musée d’Orsay sets itself apart. They are constantly rotating their collections – literally every two weeks they refresh it, ensuring that the public gets an honest, sweeping view of their full collection. It is a gift to the public that merits the tip of anyone’s hat. But it also means that it doubles my work as a treasure hunt-creator. A hunt I built yesterday will only have a lifespan of 2 weeks, till an integral piece of the hunt may just be taken down. For that reason I’m probably going to develop THATd’Or to a high-end market of luxury travelers. Could you tell us a bit about your background? How did you end up in Paris? I grew up in NY’s West Village and went to Friends Seminary, a Quaker school on 16th Street. I spent a lot of time in Europe growing up, with family summers here and school years abroad without my family in Rome, Florence and London. After being graduated from university I took a 9 month trip around Asia by myself, but other than that I was through and through a New Yorker (sometimes with brief sojourns to Brooklyn, depending on boyfriends). When it came time to get a job I rooted myself in the publishing world, first at a literary agency and then over to magazines at Condé Nast. By the time I was nearly 30 I was finally freed of being executrix to a complicated estate and suit that had taken several years (my grandmother had died when I was 27). It was hands-down the most intense, unhappy yet somehow enriching (through pain, and just plain missing her, I suppose) period of my life, where all balance was lacking. I had worked at Vanity Fair (as the culture list editor) for several years, which was a ‘career’ I was told by many not to forsake, but when I was given the physical freedom from my grandmother’s rent-controlled Christopher Street penthouse, I fled to Paris. Not for Paris, but as sheer escapism. Somehow this lovely city wrapped her arms around me and got me back to a new normal. Nourishing my new self in the old. I didn’t actually ‘move’ here, it’s just that I never went back. Several factors went into it. I’ve been working at a corporate real estate consultancy for several years and it’s dumbfoundingly dull. Quite honestly being there makes me feel like my soul is being sapped from a molasses tree (dope? Maple tree? Whichever one is slower and more painfully plodding). On the other-hand I can’t very well quit (toddler, mortgage, etc) and in all honesty according to any French standard it’s quite a good job – only 15 minutes from home, the best status contractually, beautiful offices, lovely office-mates, etc. And security is supreme in France. Just change an hour for the workforce and they take to the streets. The problem here is that unemployment is so high and job security so strong that it’s very scary to just up and quit (thus our very stagnant workforce). Just to give you a sense, I sent 250 resumes to get my current job in 2007 (pre-Lehman-Brothers-world-disaster-doomsday), so leaving without an alternative isn’t so smart. Yet, if I worked anywhere else, be it in the private sector or an OECD, UNESCO, int’l-sector job I think I’d probably be sailing the same straits. It had been years since I’d had a job which stimulated me, pulled on my Art History education and gave me a sense of ownership. But another factor to starting it was having Storsh, my toddler, and the idea of being able to manipulate my schedule to fit his as he grows. Of course who knows whether all of this will work, but if I can replace my day job with THATLou I’ll be on cloud nine, because really, what could possibly be more fun than planning someone’s romp amongst the most beautiful treasures in the world? Yeah, little things like oh, the FRENCH STATE, social charges, reams of paper called “dossiers”, copyright law and of course the venally large taxes that come with any socialist country. The logistical side of the company has been exhausting and luckily I’m in very good hands (my clever Argentine husband, who understands the intricacies of French tax law to a tee, god bless him). But as an American I really oughtn’t complain about the French state, though. I have full medical coverage without thinking of it as anything other than my “right” and my toddler gets 4-course meals each day at his crèche for pennies. I really love creating the hunts — researching the pieces, considering their location at the Louvre and placing them apart (ha ha! You must strategise! ), embedding the bonus questions craftily in the text. It all just makes me happy to think of the treasures people will see as they go looking for the treasure in the hunt. And for some reason my ideal participant isn’t necessarily interested in art beforehand, but is a competitive soul who wants to beat the other teams, so they do their homework, they read the blog posts that might apply to their hunt and they come away 1) winning and 2) actually wanting to go back to the museum to see the what they missed! 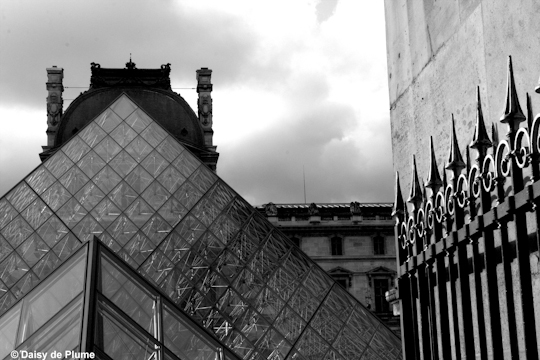 I feel like THATLou is one big con-game on trying to get people into feeling some sort of ownership of the Louvre. It’s a palace of 65,000 m², it has 35,000 works of art, Henri Loyrette (director of the Louvre) said you’d have to walk 8 straight miles to cover it all. Those statistics overwhelm people, and make their visit obligatory and a drag to check off. It tickles me pink to think that I might be able to get some people enthused to go and to have fun while they’re there. As I was growing up my mother, who was an art historian, brought me to the Met for a few hours each Sunday afternoon. She created games with the paintings to keep my interest (and, I suppose, to give her some precious moments of quiet, I realize now that I’m a parent). We laugh about it now, because some of those games had monetary prizes (as I got older her games became sheer bribery for learning about what elements comprise the annunciation, for example). Who knows, perhaps she planted this entrepreneurial seed of having fun with art. But from her perspective and real aim – my education – her methods were clearly successful as I ended up with a degree in art history. If I can get just 30% of the people who play THATLou to want to go back to the museum then I’ll have accomplished my mission. Well I’d like to arrange some partnerships with Parisian hotels and tourist industry captains, sending luxury travelers to Paris. At the moment I’ve been dealing with clients directly which has been a great pleasure, but I’d be interested to see how some professional agreements might develop the company to the next step. They say you can’t judge a company till it’s been in business for three years. My goal by the 3-year mark is to expand across the channel and pond to develop THATBrit (British Museum). But first things first, I would like THATLou and THATd’Or to steady themselves before hopping any bodies of water. What advice do you have for first-time visitors to Paris who want to see the best of the museums but without getting overwhelmed? First and foremost: Come on one of my treasure hunts! But also, apparently the Paris Museum Pass is really worth it. Time and again I’ve been told my clients that its value lies in skipping the enormous lines that can eat up whole afternoons at any one of the many museums here. Daisy, I can’t thank you enough for sharing all this wonderful information with us! And thank you for sharing your lovely photos. I look forward to Part 2! !